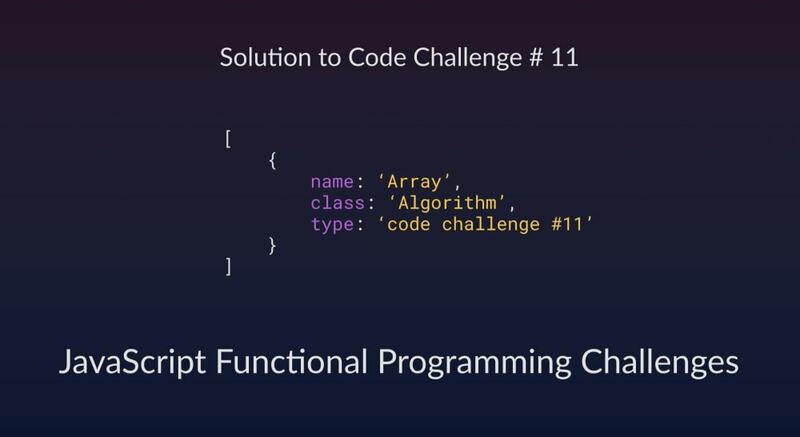 Tried the code challenge #11? In that, we delved into solving basic array problems using array methods such as map(), reduce(), filter() etc. You can find the awesome entries in the comment section of the post as well on Twitter using the hashtag #scotchchallenge. Also, you see some other fantastic submissions for the challenge if you check out the Scotch Slack Group as well as this Spectrum thread for the challenge. Functional programming is a style in writing programs which utilizes functions and function evaluations to carry out computations. In this challenge, we were tasked with solving problems by manipulating given arrays in a base codepen. This challenge will be solved using native array methods to manipulate the given array. With methods, we are basically applying pre-created functions on the array to achieve our desired result. While this challenge has no view, results will be logged to the console. You can find the base codepen provided below. Mutating methods make changes to the original array whilst retaining the variable name whereas non-mutating methods create a new array with the result of the function application. This is done using the filter() function to return all objects whose age property value is less than 24. The result is logged to the console. To solve this, first, we utilized the map() method to iterate through each object in the array, fetch the age of each user then use the reduce() method to sum up all the age values into a single value. Similarly using the filter() option we traverse the array and fetch all users whose boolean value of the us property resolves to true. To achieve this we&apos;ll use the sort() function. Sorting an array of objects using particular properties such as name or age can be tricky as compared to sorting array items with strings. For us to sort the array, we will be creating a comparison function first converts the name values to be enumerated to lowercase. A ternary operator is used to conditionally return a value depending on which enumerable property is higher when compared. Sorting all users by age is more straightforward as enumerating numerical values are quite simpler. The sort() method is used to arrange the users according to their age. In order to solve this, we employ the filter() function to pick out all users with the gender of f.
Taking it one step further again, we&apos;ll be solving the last set of challenges. Filter the array to match gender and age requirements of m and 25 respectively. Traverse the array and return the age of each user. Find the sum of all the age fetched. Here we filter the array and return users with a gender of m and over the age of 30. Find the total age of everyone in texasss, newieyork and vegzas combined. Creating an empty array to hold all the age of all users from all the arrays. Traverse each array using the map() method and return the age of each user. Add each age fetched into the empty array created using the push() method. Use the reduce() method to sum all the ages pushed into the now populated array. In this challenge, we used various in-built array methods to solve these challenges. You can try out other array methods and functions, also dig the difference between methods with similar capabilities. Feel free to leave your comments and suggestions in the comment section of this post and watch out for the next challenge. Happy coding!